I'm always delighted to have the opportunity to paint something personal and unique, and have the chance to get to know you better. A commission is the creation of a new painting based on your ideas and requirements. 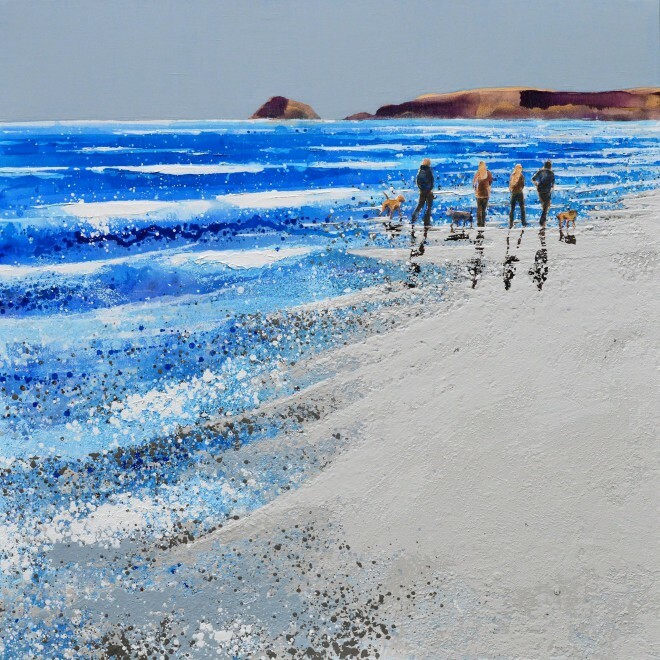 I'd love to paint your favourite beach, and include family members, dogs (always part of the family! ), surfers and horse-riders. A large commissioned painting usually takes 6 - 12 weeks to complete. We start with brainstorming and sketches. When you've chosen the sketch you like best, I then begin working in thin, translucent layers of paint, building to thicker opaque areas of colour. The painting is finished, and I email a high quality digital image for you to view. Delivery (usually in person!) is arranged, and the painting hung in prime position! The entire process from start to finish is designed to be a happy process, and as stress free as possible! If you would like to discuss a commission or would like more info, I'd love to hear from you!